The more affordable Balsamic Vinegar of Modena, a commercially processed aged variety that is made from cooked grape must and grape juice vinegar, is a great condiment to have around. I buy the ones labelled 'organic' and rated 2 leaves. I love rubbing it onto meat or vegetables that I intend to grill or roast. The flavour is too complex for me to describe accurately but it falls in between sweet and tart. 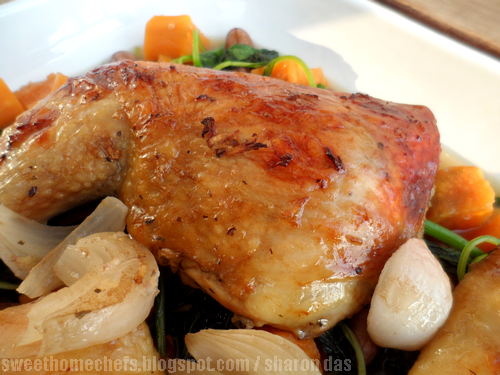 This is a simple baked chicken recipe, made wholesome and vibrant with greens and sweet potatoes. I enjoy cheerfulness in a dish so it's become a habit to have a variety of fresh fruits and vegetables in different colour on hand. Although the chicken and vegetables were cooked separately, I didn't find it too time consuming. An hour tops, if you don't count the marinating wait. I cooked and baked simultaneously. 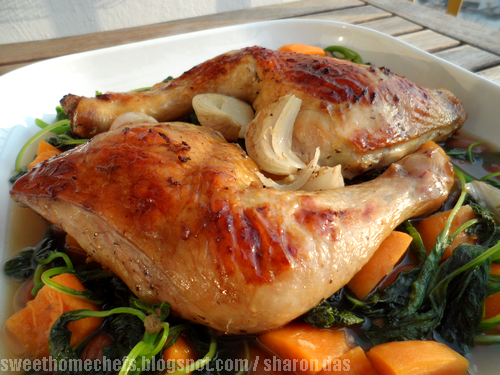 By the time the vegetables are done, the chicken is ready to be served, fresh out of the oven! 1) Marinate chicken leg with ginger, balsamic vinegar and soy sauce. Leave aside for one hour. 2) Then, mix in dried mint and onions. Place on a foiled baking pan. Keep some leftover marinade for basting. 3) Bake in a pre-heated oven for 45 minutes (more or less) at 180c. Note: Baste quickly on the 20th minute. Baste again on the 30th or 35th minute using the juices from the pan. Tip:If some spots are browning too quickly, place a small foil over the area concerned for even browning. 4) Serve on top of vegetable dish (recipe below). 2) Place on a foiled baking fan. 3) Roast for 45 minutes. 1) Boil sweet potatoes in 1 to 2 cups water until cooked. 2) Add spinach, cover the pan for 30 seconds or so. 3) Once the spinach looks a little limp, pour in the braised peanut. Stir well. 4) Taste and flavour further with oyster sauce if necessary. 5) Once everything is cooked, switch the fire off and stir in the tapioca flour. 6) Serve with baked chicken. 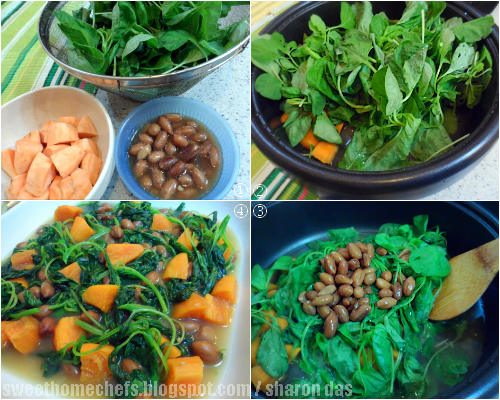 1) Green vegetables, braised peanuts and sweet potatoes. 2) Boil the potatoes, then add the greens. 3) Add braised peanuts. Flavour with oyster sauce. Protein, carbs and greens? It passes for a balanced diet surely! Wow, I'm a fan of balsamic vinegar too! 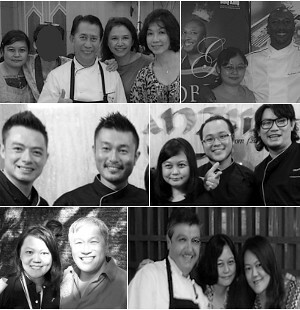 Love to try your cooking too! 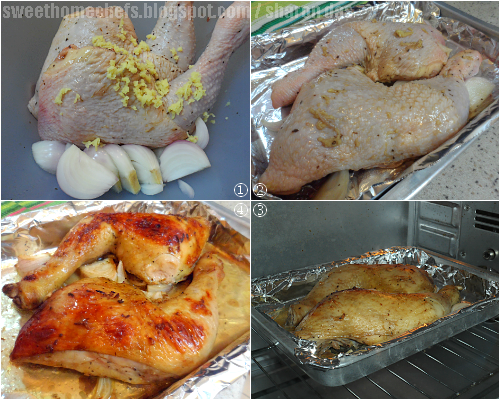 This oven baked chicken is tempting. I am drooling over it. Lovely dish, Sharon. My family will be very happy eating balsamic chicken for dinner. You have roasted yours very well... Yum! Thank you, Zoe. Sticking to the oven like glue has paid off..lol! 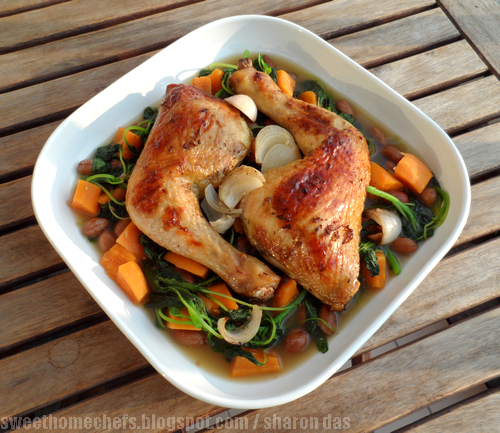 This chicken sure looks delicious Sharon...love how you serve, over veggies...yum!